Banquet cuisine is one of Chinese food’s crown jewels, a stage on which chefs can let go with imagination, artistry, and extravagance. Remarkable dishes are created for banquets, dishes that are about far more than eating pleasure and lovely presentation—because a great banquet has form, pace, and meaning, all of which the dishes support. Thematic resonance extends beyond the food to the room, the table, the serving ware, and even the invitation. Banquets have historically been at the apex of the dining culture that drives guānxi (关系), relationships, and have long attended weddings, funerals, important birthdays, holidays, and celebrations of all kinds. Whole clans hold feasts; whole villages. But throughout history, the banquet has also been the province of gentlemen connoisseurs, who expressed their personal artistry by designing and hosting feasts to celebrate art, literature, the natural world, the change of seasons, the appearance of a highly anticipated seasonal food, or simply a gathering of friends. Classic menu structure rests on mathematical symmetry, but is open enough to allow the host and/or chef to express his own style and taste (elegant? Rustic? Lavish?). A simple banquet might follow four (or eight) cold dishes with four (or eight) hot dishes. Often the cold dishes (appetizers) will be a multiple of the hot dishes, or vice versa. The hot dishes tend to climax with a feature protein dish such as a deboned stuffed duck or whole fish. In addition to these groups, two or three “pause” dishes, such as light, simple stir-fries, might be served for relief. 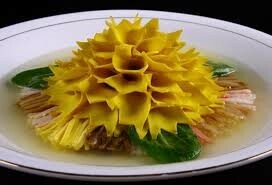 If a starch such as rice or noodle is to be included at all, it will appear toward the end. The denouement will be a fairly simple dessert course, often a luxurious sweet soup. Within this frame, the host/chef uses the menu to articulate the meal’s resonance, and to orchestrate the atmosphere. For example, very subtle dishes compliment the diner, because they require discernment. Artifice dishes delight and awaken, like mental palate cleansers. Dishes that carry symbolism and stories shape the resonance. Finally, dishes of luxurious extravagance indulge the diner, though this last effect, when overdone, has drawn criticism in prior eras from the foodie elite (who tended to be literati). In the eighteenth century, Yuan Mei wrote, “Don’t eat with your ears! By this I mean, do not aim at having extraordinary out-of-the-way foods just to astonish your guests… Don’t eat with your eyes! By this I mean, do not cover the table with innumerable dishes and multiply courses indefinitely.” His complaint still sounds quite fresh today. A salt merchant named Tong Yuejian, who lived in the late eighteenth century, wrote a book on the haute cuisine of his time which he titled Classic Cooking. His hand-written manuscript, not edited and published until the late 20th century, offers a window into the banquet structures of his time. He saw a banquet as 16-4-4-4-4 (16 appetizers, 4 fried foods, 4 stir-fries, 4 braises, and 4 rice or dim sum dishes. Alternatively, he favored 16-8-10-4-4. Banquet menus may follow trends from one era to another, but the appeal of numerical symmetry seems to be a constant. Famous Banquets and Banquet Traditions. Certain feasts are so amazing that they remain fixed in the imagination for centuries. One example is the Flaming Tail Banquet of the Tang Dynasty (618-907), a grand meal that celebrated the ascent to high office. The name evoked the legend of a carp, fighting upstream, that is struck by lightning, set on fire, and turned into a dragon, the dragon symbolizing the emperor, who granted the high office. The feast, an obligation of top-level appointments in that era, was known for its extravagance. One menu (saved by a family, then discovered and annotated by descendants over 200 years later) detailed a Flaming Tail Banquet from the year 709, with 58 dishes ranging from thorn-apple pastry, to brown turtle, whole roasted lamb, grilled partridge, liver cooked with rose petals, and steamed pastry in the shape of oil lamps. 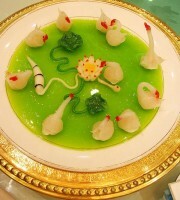 Some creations were not meant to be eaten, like the pastries portraying the banquet’s entire 70-member musical troupe. One of the most famous of all was the General’s Banquet, held in Hangzhou in November, 1151. This exceptional feast was given for the Emperor by one of his hardest-working and longest-serving generals, on the occasion of the general’s sixty-fifth birthday. Luckily, the menu has survived. First, many kinds of fruits were offered, in successive waves, from fresh, to dried fruits with nuts, to sugar-coated. Three groups of appetizers followed with intricately carved and styled vegetables, after which a dozen fruit and flower creations carried the flavor incrementally from sweet to savory. Only then did the real meal begin: 15 entrees, followed by a brief rest, capped off by five more meat and poultry entrees served with streamed bread. At this point, fruit was served again, to signal a rest, and then the finale of the feast arrived: extremely fresh scallops, sea snail, and oysters, served raw or barely and perfectly cooked. “How recklessly the rich waste food!” wrote a courtier of the time. “I remember the general’s feast for the emperor—the fifteen courses, and all the dishes that followed.” It is unfortunate that no record survives of the alcohol consumed on that night, more than 800 years ago. Alcohol certainly was one prime stimulant in the city of Hangzhou’s longstanding tradition of literary banquets; another was the beauty of West Lake, the gorgeous and tranquil man-made body of water in the city’s center. On one level the poetry-themed banquets held on lake barges trace their roots back to Su Dongpo (1037-1101), a poet, statesman, and gastronome associated with the city. A pedestrian causeway he built on part of the lake still has his name (Sū Dī, 蘇堤), and a dish named after him, Dongpo Pork, is one of Hangzhou’s most famous specialties, offered in restaurants the world over. A widely circulated story holds that the dish was born when Su started to cook pork, and then became so distracted by a game of chess that he let it stew far longer than he’d intended. True or false, the dish belongs to both the poet and the city, and to this day, after eating it in one of the famous old restaurants, you might emerge to find people writing his famous verses in ephemeral style on the sidewalk, with brushes dipped in water. One turning point in Hangzhou’s literary food trend was the mid-19th century opening of a seal engraving society (a cherished literati art form) right next to an enduring lakeside restaurant, Lóu Wài Lóu (楼外楼), which strove to delight the men of letters who congregated there. Then, as before, though, the ultimate literary banquet was held on a lovely, lantern-glowing boat that glided under the moon, on West Lake. Dishes were served to remind one of great poems and poets, wine flowed, and before long diners were quoting their favorite lines of poetry to each other, and then composing poems themselves. In at least this one form, the historical literary banquet became an exquisitely inspired, food-and-alcohol fueled poetry slam. The verses created were spontaneous, fleeting, much as the lines of poetry written in water on the sidewalk are today. Government Controls on Banquets and Feasts. After the Chinese Communist Party assumed control of China in 1949, extravagant dining was frowned upon. Almost all private restaurants were closed in the early 1950s, but banquets still went on, whether for officials, or simply in accordance with the holidays normally celebrated at the local level—for example, a village might hold an annual feast for Spring Festival (Chinese lunar new year). Through the 1950s successive restrictions were placed on the numbers and kinds of dishes that could be served at local feasts, to ensure against uneven privilege and its inevitable shadow, corruption. The severe famine of 1959-1961 which followed however, killing over thirty million through starvation, probably rendered such restrictions moot. Since the transformative “open door” period of the late 1970s/early 1980s, there have been no restrictions on banqueting and feasting by private citizens. But as China privatized, graft and corruption became a huge problem, one that is often manifested around fancy meals—so the government returned to placing intermittent restrictions on banqueting by officials (not private citizens), restrictions which can wax and wane along with anti-corruption campaigns. At this writing, limits are placed on official banquets depending on the government level, and the type of meal. Current rules dictate 100-120 RMB per person if the banquet is at the Ministry level; 80 RMB is the per-person maximum for a regular government banquet. Rare animals (shark’s fin, sea cucumber) and cigarettes may not be ordered, and there are restrictions on alcohol. The number of hosts may not exceed one-third of the number of guests. And many forms and signatures are required to stage a bureaucratic/office banquet, even with these restrictions. Modern Banquets and Feasts. The rebirth of China’s economy has brought dining back full force, and private banquets occur every night, all over China, for countless reasons, and to mark any number of occasions. Yet certain types of banquets have come back with real popularity, in trends that spotlight incredible food while also illuminating aspects of the zeitgeist. Sometimes a well-known regional banquet becomes the signature “dish” of a Province’s cuisine, and in today’s insatiable food culture, omnivorous gourmets in other big Chinese cities expect to experience it in a restaurant. 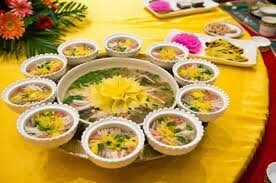 One such example is the Water Banquet of Luoyang, a stately, complex feast which has become perhaps the single most famous food of Henan Province. The 24-course banquet (which at this writing can also be booked at a restaurant in Beijing) combines 8 cold and 16 hot dishes, half of which are soup, the others emphasizing sauces and gravies. 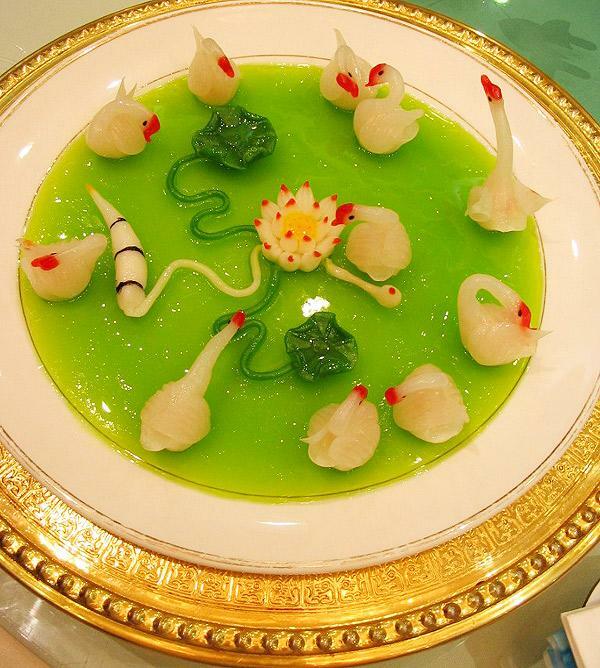 A feature of the Water Banquet is presentation, as in the first course, Peony Soup (seen below; Luoyang is also famous for its peonies). The dishes, which come with stories, are served in an order meant to suggest flowing water. A revealing contemporary banquet craze is the explosion of interest in Red Mansion cuisine. Hóng Lóu Mèng or 紅樓夢 (lit. Dream of the Red Chamber) is China’s most famous classic novel. Written ca. 1760 and still widely read, the novel’s portrayal of upper-class family life renders various banquets and all manner of dishes and delicacies in vivid detail. So filled with food is the novel that no less than 40 hónglóu càiyáo, 红楼 菜肴, Red Mansion dishes, have entered the culinary canon—and these are only the dishes based on actual recipes detailed in the book. So many additional delicacies are loosely described that chefs have a great deal to choose from in creating Red Mansions banquets. It is easy to sense the appeal of this feast celebrating a classic novel, especially in a society where both the novel and the food were completely off limits for a whole generation. Now, this greatest of Chinese stories can be explored again—and through food. Big restaurants and hotels periodically bring in guest chefs to stage a one-time Red Mansions banquet, and there always seem to be a few restaurants in Beijing specializing in the food of the novel. But the most amazing version of the Red Mansions banquet is the one currently on offer at Grand View Garden, a former sprawling TV set for a series about the novel, which was turned into a tourist park when filming was completed. At this pseudo-literary Beijing resort, the Grand View Tower Restaurant offers three different kinds of feasts based on the novel, including one for which musicians perform the music from the TV series. These extravaganzas unfold in an environment of waterside pavilions, bridges, streams and courtyards modeled after the home of the Jia family in the novel. For sheer luxury and excess, however, nothing else in modern times quite touches the fabled Man-Han Feast, or Man Han Quanxi (满汉全席) a three-day imperial feast originally designed to be eaten during six twice-daily banquets. The original Man-Han Feast was given by the Kangxi Emperor in 1720, and included 320 dishes. Unfortunately, official records of the famous event were lost during the Cultural Revolution (1966-1976), and it is unlikely the feast can ever be recreated with full accuracy. That does not stop restaurateurs from trying, however, and so-called Man-Han Feasts are periodically staged for wealthy clients in China’s biggest cities, presumably substituting more ethical ingredients for original delicacies such as tiger meat. In 2010, NPR reported on a Man-Han Feast being offered in Beijing that included 268 dishes, not counting appetizers and sweets. This feast was available to be consumed in multiple sittings over a one-year period and cost a staggering $54,000 per diner. 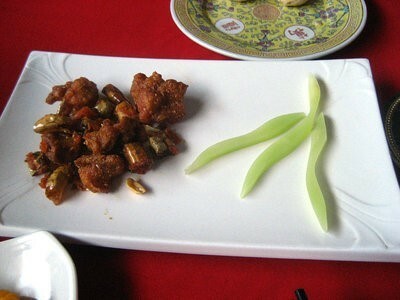 Peacock Drumsticks with chiles and peanuts from the $54,000, one-year Man-Han Feast. Tong Yuejian, the salt merchant who left behind his Classic Cooking manuscript toward the end of the 18th century, also commented at length on the menu of the original Man-Han Feast of 1720, as did a contemporaneous book called The Painted Boats of Yangzhou, which was a discourse on the pleasures of that city. While these accounts were written decades after the feast occurred, and may be no more than hearsay, they do offer an astonishing picture. The purpose of Part Five was to pave the way for more drinking. Toward this end, 20 kinds of refreshments were followed by 20 kinds of hot food, unspecified. Finally, 10 platters of fresh fruit were followed by 10 platters of dried, glazed fruit. One wonders if anyone could walk away.